We made it 2.5 weeks on one roll of paper towels! How did we do that?! We are getting better at not using paper towels unless we absolutely have too. I’m really proud of my husband and kids for getting on board with this project. Paper products are expensive and I’m really glad we’ve cut our budget so deeply. We just started our 3rd roll of paper towels and since it’s the beginning of August-that means we used 2 rolls of paper towels for all of July. Amazing! I didn’t think it could happen but it has! Looks like our paper towel weaning is working. Next step: making it a full 3 weeks on one roll! My household notebook has fallen by the wayside a little. I have it. I’m using it. Sort of. Mostly I use the calendar. I really need to get back to working with this more. I know it’s going to make a difference. I just need to keep prioritizing my use of it until it’s a better habit (I’m beginning to wonder if I have a short attention span!). Again, like the FlyLady recommended, it’s a slow going project and constantly in development. What I’m using most right now is the calendar. I’m still scribbling to do lists on scraps of paper. Not so effective. Sad but true. It’s on my “get better at it” list. I spent time making it look great-I will use it. I will! Meal Planning: I’m still working on the fine art of meal planning. I like ‘spur of the moment’ a little more than I realized and this is not effective in meal planning. However, I am good at keeping simple and flexible staple items in my house and that helps me keep our grocery budget on track. As we gear up for our homeschool year though, this is becoming more important as a time saver for us so it’s still an evolution for me-more for my time budget than my grocery budget. Our cloth diapers: Success! We skipped trying the RLR I’d talked about in the last update in favor of trying a different bar soap in our homemade laundry soap recipe. Dr. Bronner’s is a clear winner over the Ivory bar I’d been using. I’m thinking it was less a mineral deposit issue and more that the soap not rinsing completely out of the diapers (clean rinsing is very important in cloth diapers!). I’m a big fan of Dr. Bronner’s soap anyway and I like the lavendar scent. It’s subtle and my little guys bottom seems to be just fine with it! We’re sticking with cloth and very happy about it. I’ve jumped on board the Food Waste Friday wagon from The Frugal Girl’s call out. I’m excited about how this is keeping me on my toes and minimizing our food waste. Adjusting our prepaid cell phone needs. My husband needs more minutes than we’d previously needed for him so we are working on finding the right balance for his phone. I’ll keep you posted! A friend recommended using cloth napkins to continue our quest to minimize our dependence on paper products in the kitchen. I’m trying to decide if it will be less expensive to make them or buy them. I’m wishing I had an overlock machine just now to make this decision a no-brainer. But I don’t. And buying one just to make napkins definitely wouldn’t be budget friendly (though maybe it would get me sewing more again!). I’m still exploring the best approach for us on this one! I want to ask a question today: Do you know what you have to give? I ask this because I know life is busy and we don’t often think about what we have to give. But we should. We’ve all faced difficult times in our lives. I don’t know anyone who hasn’t. It is a part of the reality of living. There are peaks and valleys. That is just how life is. This week I have encountered at least five people who are struggling with personal tragedies and hardships. It made me wonder just how many people we cross paths with in a day who are quietly enduring some kind of difficulty or pain. It has inspired me to ask you to consider, for just a minute, what you have to give away. Forget, for today, financial giving. Get back to basics and more creative that that. I love quotes and rounded some up for you today to inspire you to give simply. Be gentle and understanding. You don’t know what the woman behind the checkout counter is going through today. Or the customer service person taking your call. Or the man who sits quietly next to you in church every Sunday. Realize people may be facing mountains today and they still have to get through their lives just like the rest of us. Each of us has more power to give joy and hope to others than we realize. Don’t let the opportunity to give gentleness and kindness pass you by. You might be the only one today that offers it to that person. It might change their life. Remember that when you pour out kindness, it is the kind of giving away that fills you up. Don’t hold it back. Don’t worry about the right words. Worry about the right intentions. Kind intentions go a long, long way. You don’t have to solve the economic troubles of our country, win a Nobel Peace Prize, or give a million dollars. Small acts of kindness are contagious and powerful. Don’t judge someone. Kindness isn’t judgemental. “I cried because I had no shoes, until I met a man who had no feet” Author Unknown. My grandfather used to recite this quote when I was a child and it stuck with me. It helps me remember that no matter what my challenge is, someone else is struggling harder than I am. It’s not always the big things that change people’s worlds. Hold the door for someone. Let someone else who has only a small handful of items in their cart go before you in line at the grocery store (or that frazzled mom who’s child is having a meltdown). Tell someone you like their hair or that they’re wearing a nice shirt. Notice something special in someone and tell them. Appreciate them out loud. Be kind to people you encounter today. Purposefully and genuinely kind. Giving doesn’t have to be about money. Give what you’ve got: Give away kindness. Give your time or your talent. Give away your smile. It’s the most frugal way to give because it won’t cost you a dime. Be inspired to simply give. You’ll be glad you did. Posted in Inspiration Thursdays and tagged basics, frugal, opportunity, simple. Bookmark the permalink. 1.) You can eat beat greens. They are really good! I knew I’d read this somewhere before but while buying my lettuce and asking the seller about his beets, another woman was buying from the seller’s wife and explaining that she actually buys the beets more for the greens than the sweet dark red root. My interest was piqued. Anytime I can get more value out of an item without paying any more for it-I’m all for it! How much more budget friendly and frugal is it to use all of the vegetable that you’d previously only used part of? And unless you live under a rock, I’m sure I don’t have to tell you how very healthy greens are for your diet, including beet greens. We came home and roasted the beets. We cleaned and chopped the greens for dinner. Guess what? My kids ate them both happily and asked for more! How much more proof do you need than that? 2.) Hens don’t lay eggs in really hot weather. 3.) Too much rain leads to fatter, more swollen zucchini. 4.) How pleasant our community can truly be. We don’t have many shopping options here other than the big Walmart. I’ve found most people are in a terrible mood in the long line they have to stand in after battling through the store in the first place for all they need. It is a pleasant change of pace to not have to stand in long lines while your child asks for the chips and candy neatly lined up at his eye level while you make your way to the conveyor belt that rolls your items up to checkout. I’ve been known to chat up just about anyone and have made a friend or two in my local Walmart. But it is nowhere near the gratifying experience of talking to someone about the work and care they’ve put into their product or their art. There is a warmth and twinkle in their eye that can’t be found on the shelf at a store. It was real community. The way it’s meant to be. It makes me want to go back. It makes me want to make a better effort to know my neighbors just a little more than the pleasant perfunctory wave as we come and go. 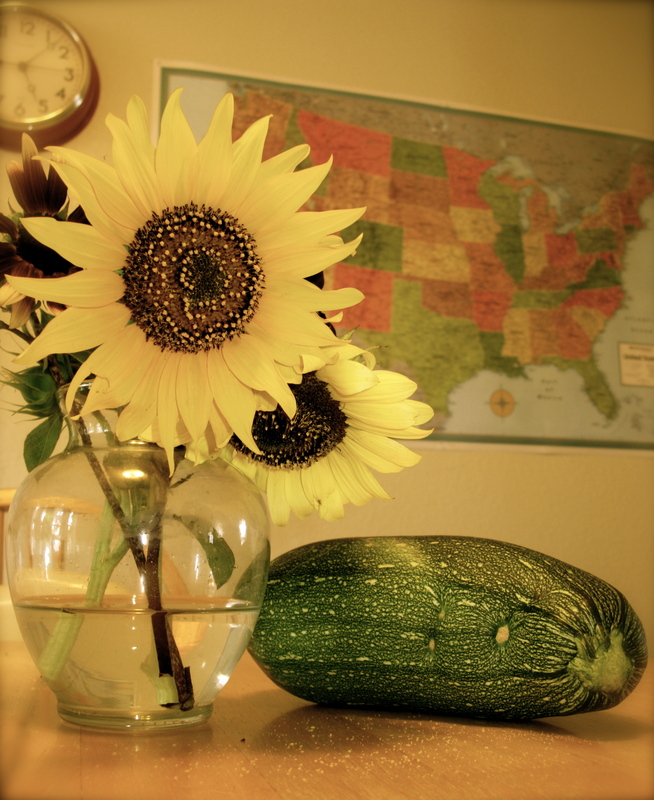 Maybe on my next visit to the Farmer’s Market I’ll buy more zucchini and bake loaves of bread for my neighbors. Nothing liked homemade baked goods to open the door to neighborly friendships! 5.) Just how enthusiastic children will get when they are so involved with the experience of their food. My oldest son came home talking a mile a minute and wanted to make everything right away. He was inspired and excited. It was so fun to see him so amped up over vegetables! My children are good eaters. I rarely have to “make” them eat their vegetables or fruits. They understand the importance of healthy foods. Our trip took my sons understanding to a whole new level. He helped me roast the beets and cut up the beet greens and has declared a new love for both. He carried the giant zucchini around so much that I finally had to explain that we needed to put it in the refrigerator till we were ready to make the bread. He inspected the sunflowers we bought and decided he needed to know how many types of sunflowers exist (we bought one bloom each of the four different varieties offered). He inspected the leaves, the bud that had not opened and the petals. He was fascinated by the pollen that he found on the table beneath the large blooms. He wanted to know more about how bees use pollen because he already know that bees like pollen. So we Youtube’d bees and watched them busily go about their task at a big sunflower (a happy coincidence, by the way) and this turned into a discussion about how the honey is then made. 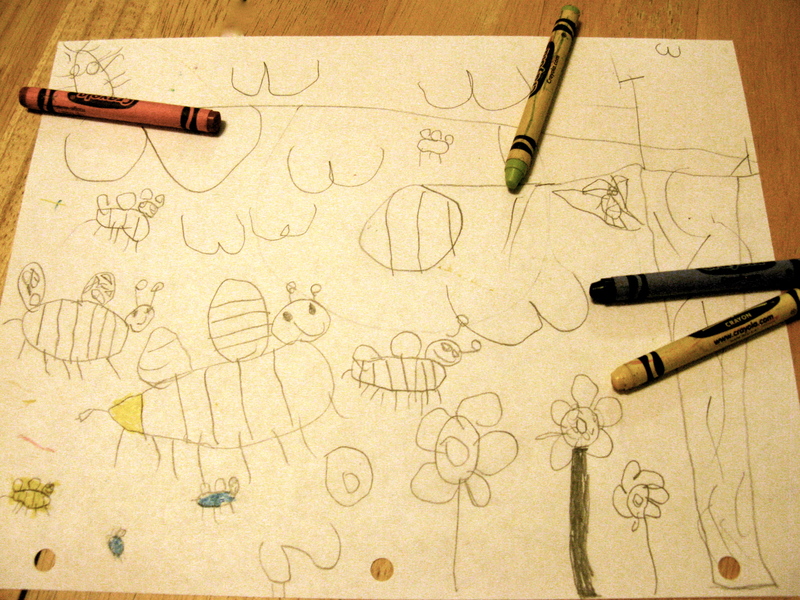 Which produced a lovely drawing that he has plans to color tomorrow. He gave me permission to share his work in progress with you. There is a photo of it at the bottom of this post. 6.) That you can keep lettuce fresh in a mason jar. Now. To be honest, I didn’t learn this at the Farmer’s Market but my trip inspired the search that led me to this little gem. There were such amazing greens available at my Farmer’s Market that I came straight home and searched the internet to find ways of preserving any future bounty of greens and lettuces I might bring home. I stumbled across an irresistible website about making salad in a jar. What an unusual concept! I was so fascinated I had to share her blog with you! She also happens to have great instructions for making Greek style yogurt at home. I haven’t tried it yet but it’s on my short list! 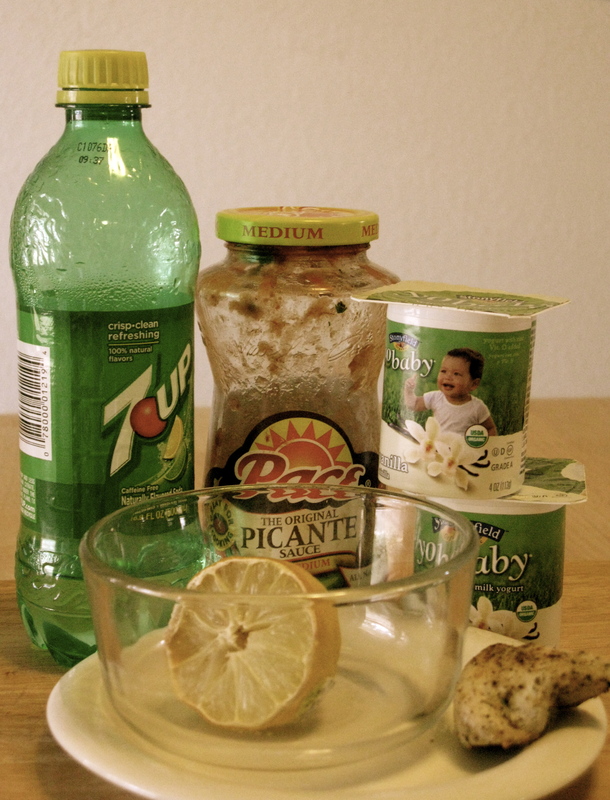 Check out this excellent blog Salad in a Jar. Even if you don’t go to a Farmer’s Market anytime soon-she’s got some great food stuff going on and I really enjoy her writing too! 7.) I learned just how processed even our fresh foods are from the grocery store. While it took a little more work to get the dirt off of what we brought home there was no denying how fresh and local it was. It was worth the extra elbow grease. 8.) That while it wasn’t a big budget saver, it didn’t break the bank either. We had a great experience and brought home some great produce. I learned a lot. My kids learned a lot. And most of all, it was a wonderful way to spend a Saturday morning. We’ll be heading back again this weekend, I assure you. Art from my 5 year old. Inspired by our trip to the Farmer's Market and the pollen from our sunflowers. Posted in Practical Things and tagged budget friendly, cost effective, farmer's market, frugal, simple, simplicity. Bookmark the permalink. I realized recently that we are throwing some of our money away. There’s an item that makes it’s way onto our shopping list far more often than I like because we seem to go through it faster and faster. I found myself scratching my head and trying to consider how to stop this small, but irritating loss as I tossed out yet another center cardboard tube left by the paper towel roll. How had we gotten to the point that one roll of paper towels was lasting only 2 days in our house? We’d developed a bad habit of grabbing paper towels at the slightest need and were mowing through them at an alarming rate. As I mulled this over, upon tossing that recent cardboard tube, I wondered how paper towels even became such a staple in homes today. This is, essentially, a convenience item. What did they use before paper towels? There had to be a way around this. After all, I told myself, I’d figured out how to make my own laundry detergent, and I use cloth diapers and wipes and make my own cleaning spray for my kiddos bottom. There just had to be some way to stop this waste. I did a little research and sure enough, there are plenty of people just as irritated about this wasteful grocery list item as I am. The answer? Rags and dishtowels. Re-use them. Wash them. The challenge was on! So where to start? First I took a few minutes to assess the paltry collection of dishtowels and washrags I had in my kitchen drawer. Most were in sore shape and, really, I didn’t have nearly as many as I thought I did. Clearly I needed to bulk up my supply if this was going to work. On that next shopping trip I managed to collect some bar-mop style towels in 5 packs as well as packs of inexpensive dish rags for what I usually spend on a big pack of paper towels. I now had a good solid start to my cloth towel and rag stockpile. During this shopping trip I allowed myself to buy only a 2 pack of paper towels. Like most habits, it’s easier to wean than go cold turkey. I came home and announced that we were on a mission as a family to wean ourselves from the overuse and waste of paper towels. 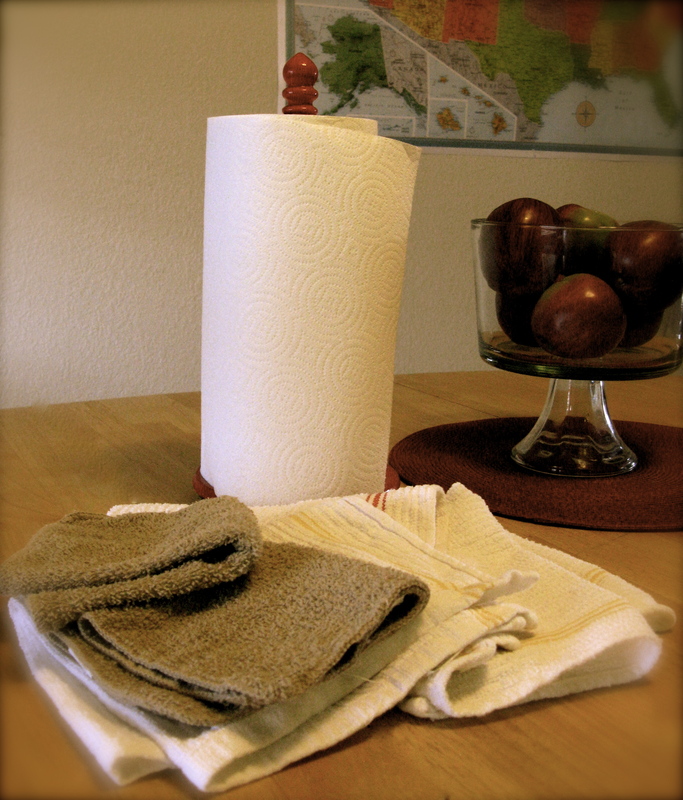 Our goal for week 1: To get through seven full days on one single roll of paper towels. When we can achieve this, we’ll graduate our attempts to getting through two whole weeks, and so forth (I’d read about one woman who uses only one roll or so a year! Wow.). So far, we are a week into this experiment. I can’t believe how ingrained my first instinct to reach for a paper towel has become. I’m having to retrain myself to reach for the dishtowel instead. Now, in the grand scheme of my grocery budget, is changing my paper towel habit going to save me untold riches this year? Probably not. I do realize, there is still a need for paper towels to some degree in our house and that paper towels can, on occasion, be the better choice. But I’d been suckered into a mindless convenience and it was costing us. That bothered me. I’ve found, as with my cloth diaper adventure, I am saved the aggravation of running out completely and needing to make a trip to the store since all I have to do is toss them in the wash. It’ll save me about $10-15 a month (yes we had a REALLY bad habit) which translates to about $120-180 a year in savings. I can even help keep some waste out of the landfill with this new habit which is a nice thought. But really, for me, it’s part of unravelling the real challenge of finding the little habits of convenience that sneak into my life that add up. Are these conveniences really worth the cost? So far, I’m loving the dishtowel and dishrag upgrade to our kitchen. They work much better. I’m finding this is, indeed, a good habit for us to break. It’s good for my grocery budget, and, if you are so inclined, it’s “greener” living. It’s a frugal, budget friendly solution. I have a feeling we won’t be going back. Posted in Practical Things and tagged budget friendly, frugal, practical. Bookmark the permalink.